Extraction and packaging innovations that prolong shelf life mean that consumers can now experience the subtly sweet taste of plant water taken directly from maple trees and birch trees. “With the right marketing and distribution strategies, these new waters will be a $2 billion (€1.5 billion) business by 2025,” predicts Julian Mellentin, director of New Nutrition Business. With natural benefits like these, plant waters have no need for health claims. Sales of coconut water have been surging for five years – with no products carrying any heath claims – driven by consumers’ desire for drinks that are “naturally functional” and have no added sugar. In fact “naturally functional” is the biggest driver in the industry, according to the New Nutrition Business report 12 Key Trends in Food Nutrition and Health 2014, and is the force behind the success of coconut water and almond milk. Maple trees are known as the source of maple syrup, but they also yield a beverage much more in line with the preferences of health-conscious consumers – maple water. Maple water, like coconut water, is naturally rich in vitamins, minerals and 46 antioxidants that make it a potent healthful beverage. Maple water also has an inherently sweet taste – and overall a taste profile that gets a higher score than coconut water in consumer research, although the sugar content (primarily sucrose) is only 2%-3%. Maple water, or sap, is in fact the raw ingredient of maple syrup, traditionally processed into syrup because the water spoils after just one day. But developments in aseptic packaging via Tetra Pak, combined with processing maple water the same day it is collected, mean water can now be made commercially available. A trio of Canadian entrepreneurial brands – Oviva, Seva and Maple 3 – are developing the market. Maple water has the potential to reach the same market size as coconut water over the next five to seven years – provided that maple water brands apply the same lessons as did coconut water, focusing initially on single-serve packs (250-330ml) and upscale distribution and pricing. Birch sap is produced by birch trees every year in early spring and is harvested as a health drink in countries including Japan, Korea, Scandinavia and Eastern Europe. The sap is completely clear and slightly sweet, containing just 1%-1.5% sugars. The main naturally occurring sugar in birch sap is fructose. Birch sap also contains xylitol. As with maple water, advances in packaging and processing technology now allow companies to bring birch water to market in its all-natural, no added sugar form. 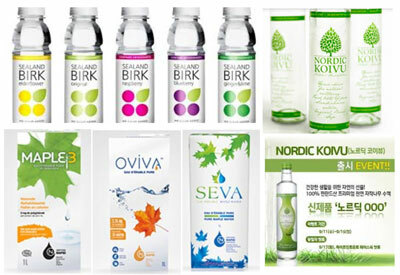 Brands such as Finland’s Nordic Koivu, whose patent-pending technology has allowed them to collect and bottle the birch sap without adding any preservatives, and Denmark’s Sealand Birk are rapidly developing the consumer market. 12 Key Trends in Food, Nutrition & Health 2014 is available to purchase online now at http://www.new-nutrition.com. The key trends analysis, published every year since 1996, draws on interviews with 450 food and beverage executives worldwide, as well as on material from the journal New Nutrition Business. It is the only trends analysis that differentiates enduring trends from short-term fads, using a methodology (shown in the report in the unique Trend Diamonds) that takes into account every factor driving a trend’s evolution – from ingredients and science through to consumer needs and sales figures. 4. Julian Mellentin is one of the world’s few international specialists in the business of food, nutrition and health. He is director of New Nutrition Business, which provides case studies and analysis of success and failure in the global nutrition business and is used by more than 1,700 corporate subscribers in 42 countries.